Wheels pitches 10 of the biggest sellers in the medium-to-large car segment to see which is the best of the current crop. Here’s number 3, the Holden Commodore. Can’t wait to see the final score? Jump to the verdict now. THERE’S plenty of myth surrounding Holden’s defiantly relevant and ever-popular Commodore. While it might look like a dinosaur on paper, championing rear-drive and a large-capacity, naturally aspirated six like its ancestors have done for decades, the reality remains rooted in the present. Make no mistake, as far as family sedans go, the VFII Commodore is at the pointy end for space and comfort. It’s the only car here than can easily seat three across its deep, beautifully trimmed rear bench and cedes chauffeuring honours to the Skoda Superb mainly due to the Czech sedan’s enormous legroom. But a few crow’s feet are starting to show. By virtue of its drivetrain layout, the Holden has a large centre hump to accommodate its driveshaft, its rear cupholders are in a fold-down ski port, and there are no rear 12-volt or USB outlets. But it compensates with air vents, nicely padded door armrests and a deep, flat boot with a full-size 18-inch alloy wedged underneath. Things are pretty impressive up front, though, with deeply supportive yet broad buckets, plenty of adjustment range (for the driver, at least) and a nicely kitted cabin for its $40K ask. The SV6 Black’s charcoal dash trimming modernises Commodore’s three-year-old interior, and we have no qualms about its chunky steering wheel and neat switchgear. 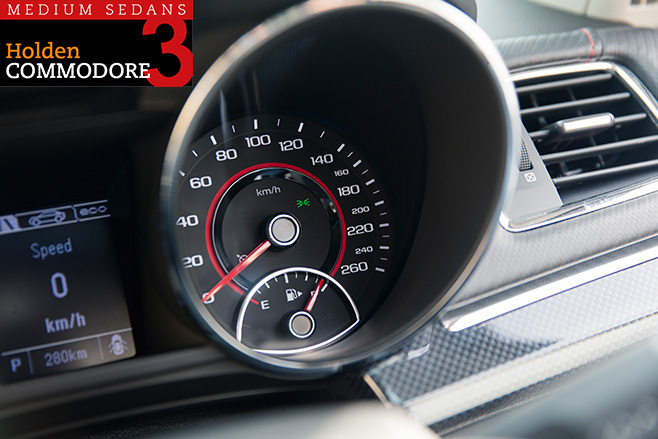 Only the thickness of the A-pillars and the SV6’s low-grade instrument-pack screen graphics lower the tone a touch. 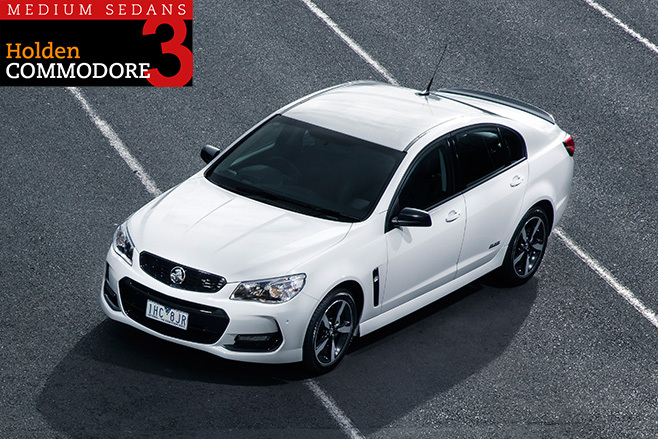 Externally, Commodore remains timelessly handsome, and on the road it’s still an entertainer. Holden’s ageing 3.6-litre V6 might sound thrashy up top, but it loves a rev and offers big-hearted performance to easily match Skoda’s rapid, but traction-deprived Superb. Who said you need a turbo? Where the atmo Holden concedes ground is in everyday driving. It can’t quite match the effortless low to mid-range punch of the gruntier turbos, and its 11.4L/100km test average is the group’s thirstiest. Still, for the largest and heaviest car here to be within half a litre of the Sonata, Optima and Mondeo says volumes about the Holden V6’s competence. That underlying ability really comes to the fore on challenging roads. You can tell the SV6 has been tuned by drivers, from the way it will manually grab a lower gear as early as possible (unlike the recalcitrant Korean twins) to its keenness to change direction. 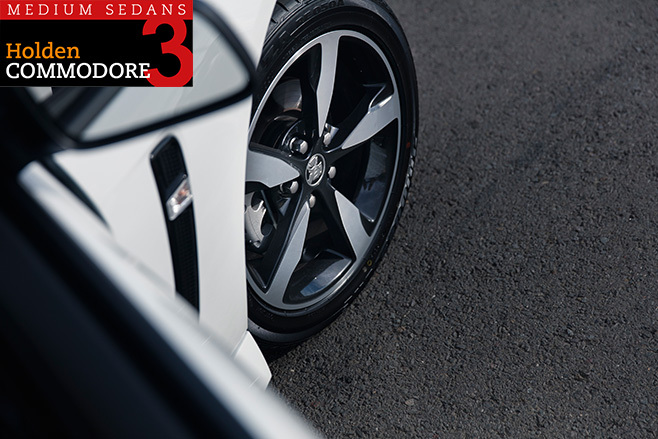 With less weight over its nose than a V8 SS, the SV6 displays superbly accurate yet progressive turn-in and a light-footed agility that belies its size and wheelbase. With great power-down and ample grunt, it proves you don’t need a V8 to have fun in a Commodore, though it lacks shift paddles and its ride is arguably too firm. Had we tested the VFII we wanted (see breakout), ride quality would’ve been a highlight, but the sporty SV6 doesn’t offer the suppleness we know its chassis is capable of. Even with a full load, its knobbly ride constantly nibbles away at its sense of calm, though big-bump damping excellence, taut body control and hushed refinement all remain part of its repertoire. If we were buying a VFII Commodore for $40K, we’d stick with the supple Calais and trade the SV6’s firmness for a sweeter package. Either way, the rear-drive Holden is withstanding the test of time incredibly well. Strong, spacious, well-equipped and suited to the demands of Aussie roads and families, it’s a proven formula that deservedly keeps on giving. We asked for a base Calais but ended up with a limited-edition Holden Commodore SV6 Black because apparently our favourite non-Redline VFII is a bit of an orphan. Had the plush-riding Calais been on the grid, it would’ve likely rated 8.0 stars. But there’s no denying the value of the SV6 Black sedan (currently $38,990 driveaway). 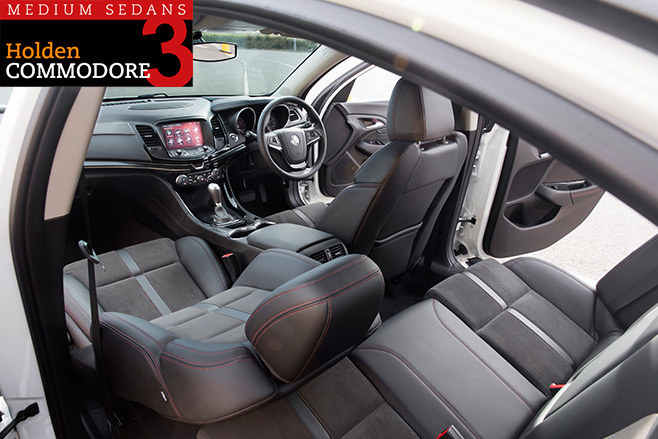 A head-up display, sat-nav, black-out grille, trim detailing and mirrors, black lip spoiler, bespoke 18s, red seat stitching, ‘Black Edition’ floor mats and badging are all part of the deal. And 20-inch ‘Baretta’ black alloys are a $1000 option. Want to compare the field? Check out all the Family sedan finalists.